Discover the first bed that adapts dynamically and automatically over time to your morphology and behavior while you sleep. iBedFLEX® is designed to maximize your rest and help improve the health of your back, through continuous monitoring during sleep and postural profiles defined in collaboration with the Proschlaf Institute. With iBedFLEX® you will always make the right choice for your bed. iBedFLEX® learns from your movements at bedtime and from your possible body changes through numerous sensors arranged on the entire surface of the mattress. Since you are able to control the bed from the Smartphone or tablet, you can take your bed anywhere and apply your personalized profile to any other iBedFLEX® bed you may have access to. Unlike other intelligent mattress systems,, iBedFlex® measures the body shapes of one or two people and their possible changes over time, adjusting the firmness to each one of them improving comfort and ensuring a restful sleep. 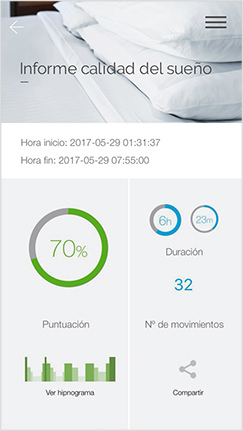 You can configure your Flex smart bed automatically or manually, according to your preferences, through its simple App installed on your Smartphone or Tablet. You will have total control over the bed, its 8 configurable zones and the information generated. • Personalized/strong>. With iBedFLEX® you will always make a successful choice for your bed because it suits you. needs during sleep in order to improve and optimize the way you sleep. blood flow circulation at the capillary level, enhances cell activity and improves the feeling of well-being. • Number of sleeping hours.